A raging war enflaming Hoboken and county points beyond is threatening Armageddon with the stakes starting with Hoboken City Council President on one side and Hudson County and Northern NJ unity on the other eyeing the highest elected office in the entire state: Governor of NJ. Once again, it's the corruptive qualities of the Mason family checkbook causing both a laugh track and blowback of a different quality than the cost of injustice hammering down on the Harridan household of upper Hudson Street as reported on Grafix Avenger. Old Guard council races this November for it. NJ Governor in Mayor Steve Fulop, she's armed and ready. Multiple independent sources now say it's not solely the Russo clan looking to sponge Mason family dollars for a council run this November. Add the highly controversial Carmelo Garcia among those with hands out looking for Mason's rumored illicit financial sponsorship. Individual maximum contributions are officially capped at $2,600 by law. 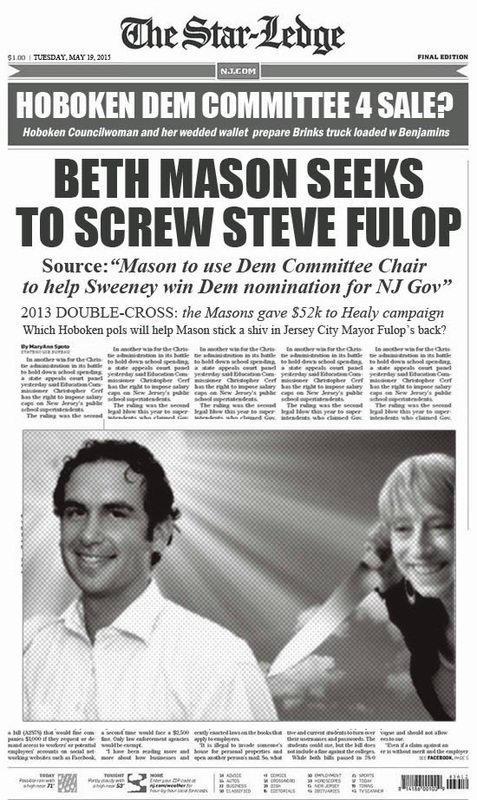 When was the last time Beth Mason showed any respect for NJ campaign laws? Does anyone have the US Attorney's or NJ Attorney General's phone number on speed dial? It will take that level of law enforcement to stop the illegal plan reported here earlier funding the Old Guard ward elections this November. A vote for Hoboken Democratic Committee Chair won't come until after the June Democratic Committee elections but the rift on the Mason checkbook strategy is already fracturing at both the Hoboken and county levels. One reliable source says Freeholder Anthony "Stick" Romano among other county level officials is most definitely not on board backing Beth Mason. The diplomatic Freeholder wants to stay above the fray and keep away from anything remotely damaging (or illegal) with Mason monies spraying every which way as he eyes a potential run for mayor in 2017. The venom invested by Beth Mason against sitting Chair Jamie Cryan is evident in the malarkey being pushed by her political operatives. First, Beth Mason is not going to run any "ticket" for Democratic chair next month. The election slate of candidates for Democratic Committee is already set and the Russo clan will be holding the vast majority of the seats citywide. Those voters will decide who's Hoboken Democratic Chair. Putting aside the aid of Hades in a write-in ballot, no effort citywide will see another slate successfully elected come June for Hoboken's ceremonial party leader. The only avenue available to Mason is to buy the votes for the existing slate of expectant Democratic Committee winners and that's the only avenue she'll be taking. 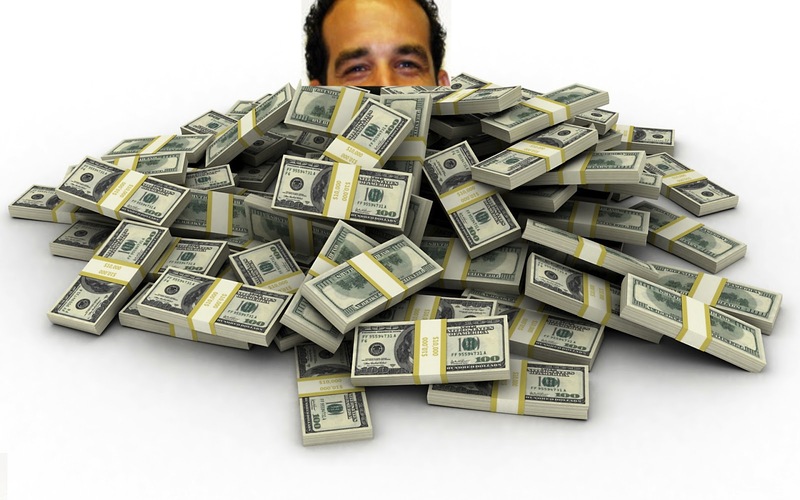 Michael Russo and Carmelo Garcia will need to weigh the risks of being on the wrong side of the law in taking the piles of illegal Mason family loot rumored on the table for their respective council runs this November. Garcia is currently staying above water as the Hoboken Housing Authority is under federal investigation after several subpoenas for irregularities under his watch. Michael Russo is looking beyond a Third Ward council re-election come November to wield control over Hoboken with a council majority and assume the reins as City Council President. For the moment, it appears a dance with the devil is one some may be willing to take. Stay tuned. Add Carmelo Garcia to the short list of people pushing Beth Mason for the ceremonial post of Hoboken Democratic Chair. He's on board with the Michael Russo plan which would mean he's also qualified to receive lots of Beth Mason family loot. Garcia is hoping to avoid the cross hairs of a federal investigation in the Hoboken Housing Authority and planning a run for sixth ward council.